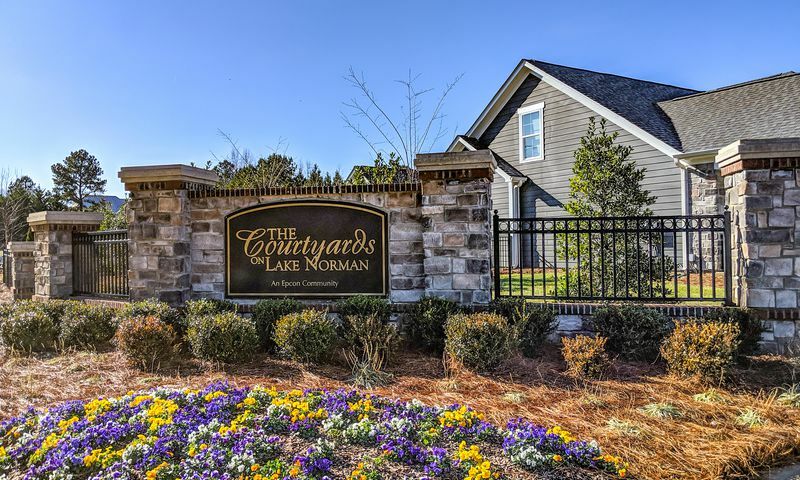 The Courtyards on Lake Norman is a 55-plus community located in Cornelius, North Carolina. It features low-maintenance single-family homes right on Charlotte’s premier recreation spot, Lake Norman. There are several private amenities for homeowners, including a clubhouse and outdoor pool. Active adults will love the community’s prime location, which allows easy access to world-class shopping and entertainment. The Courtyards on Lake Norman features several private amenities, including a clubhouse with a multi-purpose room and fitness center. The community also includes an outdoor pool with a patio, and walking trails. The community’s ideal location on Lake Norman means residents can access the lake from the neighborhood, as well as launch their kayaks taking advantage of The Courtyards on Lake Norman’s kayak storage. Epcon started construction of The Courtyards on Lake Norman in 2016. Upon completion, the community will contain 67 attached homes. Residents can choose from three separate models, Palazzo, Portico, and Promenade. These homes range from 1,619 to 3,544 square feet of living space. They include two or three bedrooms, two or three bathrooms, and two-car garages. These homes include features like open plan, gourmet kitchens, private courtyards, and first-floor master-suites. Residents in The Courtyards on Lake Norman enjoy on swimming, kayaking, and staying in shape. The homeowners’ association fee covers outside maintenance, including lawn care, irrigation, and common spaces. This allows residents to spend more time with friends and family, or take part in the many social clubs and events hosted in the community. The courtyards on Lake Norman is ideally located in the growing Charlotte metropolitan area. There are a number of grocery stores located minutes away from the community, including Harris Teeter, Publix, The Fresh Market, and Food Lion. Restaurants in the area include Chili’s, Johnny Rockets, Hardee’s, and several highly rated independent restaurants. Homeowners will have no lack of options when deciding where to shop. Some options include Target, Sam’s Club, Kohl’s, Belk, and Lowe’s. Golfers will love being near so many different courses. Just a short drive from the community is Barkdale Golf Club, Peninsula Club, and Mallard Head Country Club. The community’s location on Lake Norman means residents will have easy access to the area’s most popular recreational lake. Homeowners can boat, kayak, fish, swim or BBQ right in the neighborhood. Nearby medical services are provided by Lake Norman Regional Medical Center, Novant Health, and Huntersville Medical Center. There are also several pharmacies a shortwalk away from the community. The Courtyards on Lake Norman is located minutes away from Interstate 77, with downtown Charlotte just a 30-minute drive south. Charlotte is home to a wide variety of shopping, dining, and entertainment. There, residents can enjoy professional sports, the NASCAR Hall of Fame, and Carowinds theme park. Homeowners looking for a trip further away can fly out of Charlotte-Douglas International Airport. An ideal setting makes The Courtyards on Lake Norman a sought after 55-plus community for active adults in Cornelius, NC. There are plenty of activities available in The Courtyards on Lake Norman. Here is a sample of some of the clubs, activities and classes offered here. Residents can choose from three separate models, Palazzo, Portico, and Promenade. These homes range from 1,619 to 3,544 square feet of living space. They include two or three bedrooms, two or three bathrooms, and two-car garages. These homes include features like open plan, gourmet kitchens, private courtyards, and first-floor master-suites. 55places.com is not affiliated with the developer(s) or homeowners association of The Courtyards on Lake Norman. The information you submit is distributed to a 55places.com Partner Agent, who is a licensed real estate agent. The information regarding The Courtyards on Lake Norman has not been verified or approved by the developer or homeowners association. Please verify all information prior to purchasing. 55places.com is not responsible for any errors regarding the information displayed on this website.